This category saw a big upset this year. 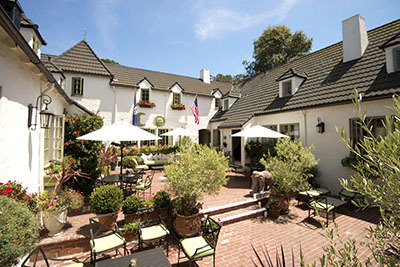 For an astonishing eight years in a row, Post Ranch Inn atop Big Sur was voted the No. 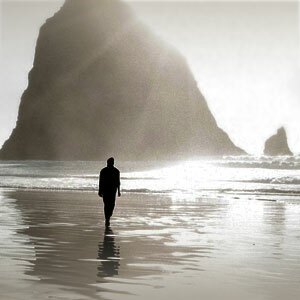 1 U.S. Hideaway. For 2016 it was finally dethroned, but only to No. 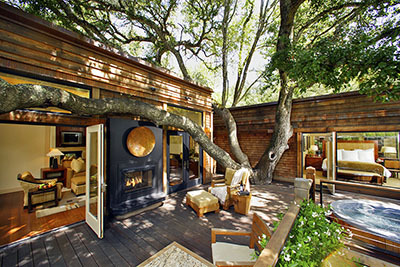 2, having been replaced by Auberge du Soleil in the Napa Valley. With an astonishing number of newcomers to the list, nine of the 20 reader-favorite United States Hideaways now hail from California. Rutherford, California — Cosmopolitan resort terraced into a hillside overlooking Napa Valley vineyards. Fifty villa-style lodgings feature gas fireplaces, oversize baths and picturesque verandas. Superb restaurant serves Wine Country cuisine, a combination of California ingredients and Mediterranean techniques and flavors. 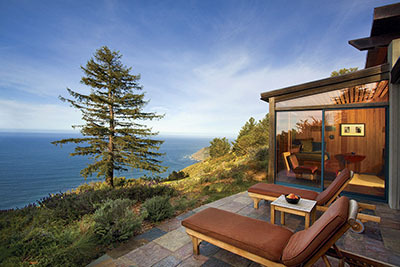 Big Sur, California —Unique coastal resort set along a bluff directly above the Pacific in Big Sur. Thirty-nine guest lodgings include Cliff House, with a deck suspended over the cliffs; the circular Pacific Suites with heated floors, woodburning fireplaces and private entrances; free-standing Ocean Houses, recessed into a ridge; plus Coast Houses — all with views of the ocean. 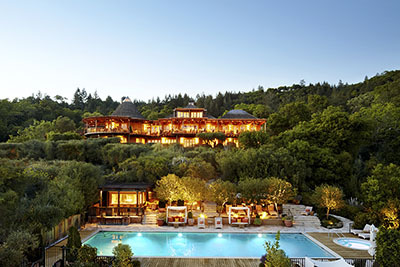 Calistoga, California — A tranquil 157-acre resort of 50 cedar-clad freestanding guest lodges in a wooded canyon at the northern edge of Napa Valley. Lodge bedrooms and living rooms are connected by furnished decks; all have fireplaces and outdoor rainfall showers. There is a pool/gym area, private Cabernet vineyard, lakeview restaurant and spa. 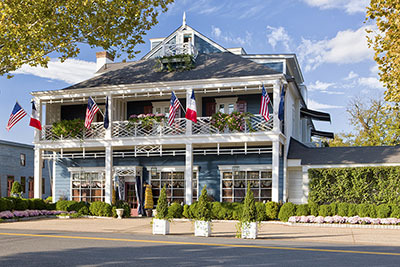 Washington, Virginia — Smartly appointed country inn and gourmet sanctuary on the main street of Washington, a rural village in the foothills of the Blue Ridge Mountains. Twenty-four guest rooms and suites contain antiques, plush fabrics and marble baths. Celebrated restaurant offers a 14,000-bottle wine cellar. Santa Barbara, California — A sophisticated 500-acre cottage-style resort in the leafy foothills of Montecito, just outside Santa Barbara. Landscaped grounds contain 41 handsome lodgings in peaked-roof cottages. Dining venues include the award-winning indoor/outdoor Stonehouse restaurant and a bistro-bar. Canyon Point, Utah — An exceptional resort set amid 600 acres of stupendous desert landscape close to Lake Powell and Glen Canyon Dam. Concrete structures contain 34 rooms, some with plunge pools. Huge central Pavilion with woodburning fires houses lobby, library, dining room and open kitchen. 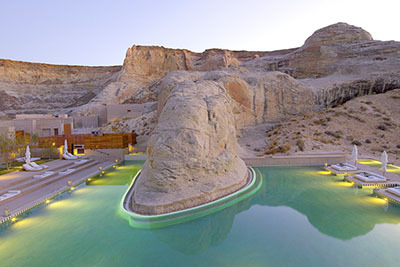 Amangiri's principal amenity is a serene 25,000-square-foot spa with gym. 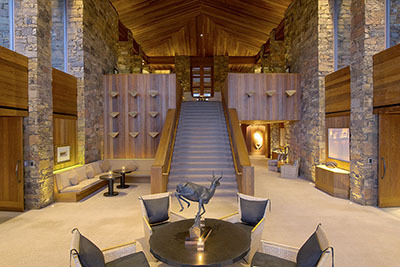 Jackson, Wyoming — A stylish resort atop 7,000-foot East Gros Ventre Butte, 15 minutes from downtown Jackson. A low-profile sandstone structure houses 40 guest suites featuring sitting areas with fireplaces, large redwood baths (two vanity alcoves, soaking tubs, slate showers) and covered decks. Breathtaking 115-foot year-round heated outdoor pool, health spa and gym. 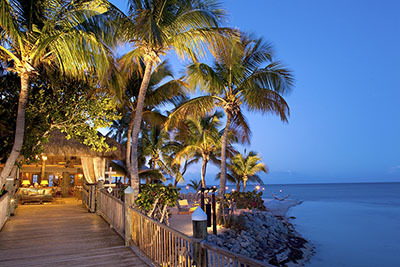 Little Torch Key, Florida — A tropical retreat occupying lush five-acre Little Torch Key, a half hour north of Key West. Thirty accommodations in thatched bungalow suites feature vaulted ceilings, whirlpool baths, four-poster canopy beds, separate living areas, indoor/outdoor showers and private verandas. A fine restaurant is complemented by a freshwater lagoon pool. 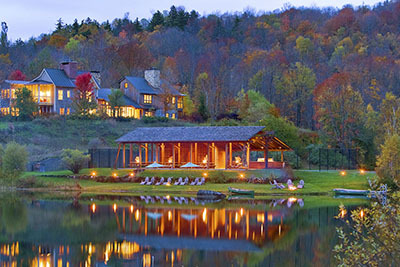 Lace Placid, New York —Classic lakefront hotel set into a scenic hillside affording lovely views of Whiteface Mountain. The well-designed Adirondack interior has wood floors, stone fireplaces, regional “twig” furniture and Hudson River School paintings. 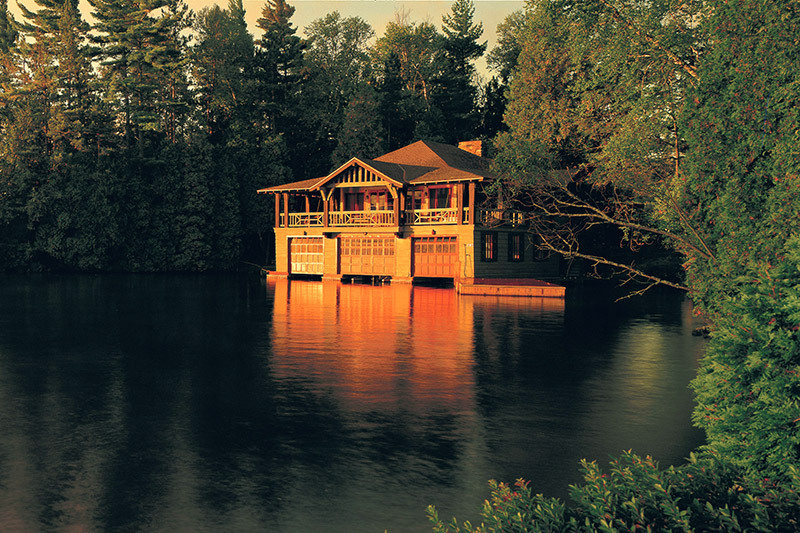 Five rooms and six suites occupy the main lodge and an adjoining building; also 17 lakeside cabins and two cottages. Barnard, Vermont — An intimate country retreat amid 300 acres of meadows and woodlands in an unspoiled valley. Handpainted murals, rich maple and pine woodwork, and American folk art adorn rustically elegant lounges. Twenty distinctive lodgings (including a self-contained four-suite enclave facing a pond) feature king-size feather beds and sitting areas with fireplaces that open onto screened porches. Carmel-By-the-Sea, California — Gourmet retreat surrounding a tranquil tiled courtyard in a convenient location just a few blocks from Ocean Avenue and the beach. This three-story stucco-clad 1929 building with colorful flower boxes and green accents offers 20 guest rooms. Excellent 12-table Aubergine restaurant. 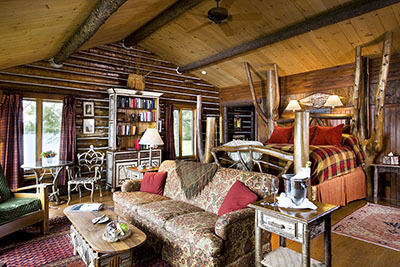 Moose, Wyoming — A historic property located inside Grand Teton National Park, 45 minutes from the Jackson airport. Its 37 log cabins, scattered among pine trees, are at once rustic and elegant, and with no televisions, offer a break from the commotion of modern life. About half are duplexes with a shared wall and shared porches; the rest are stand-alone. 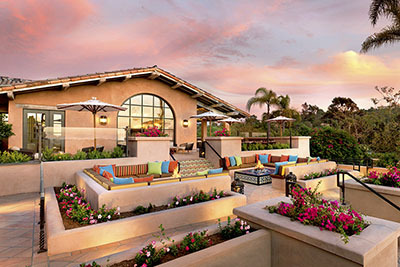 Rancho Santa Fe, California — A Spanish hacienda-style resort enclave 30 minutes north of San Diego in Rancho Santa Fe, an upscale residential community near Del Mar and La Jolla. Lush grounds contain 49 lodgings with cathedral ceilings, fireplaces, colorfully tiled baths with soaking tubs and private garden patios, some with Jacuzzis. 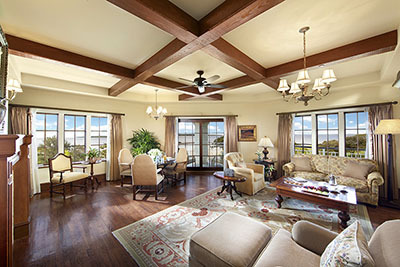 St. Simons Island, Georgia — A tranquil golf-oriented oceanfront hotel situated at the end of an avenue of live oaks on the tip of St. Simons Island, adjacent to the spectacular 18-hole championship Plantation links. 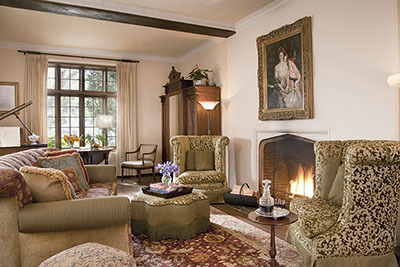 Forty luxurious guest quarters have been designed to resemble an English manor house, all with 24-hour butler service. Darby, Montana — Romantic mountain resort in the Bitterroot Valley of western Montana. Twenty-five log cabins overlook a rushing creek and fir forest. Each comes with a woodburning fireplace and massive king bed. 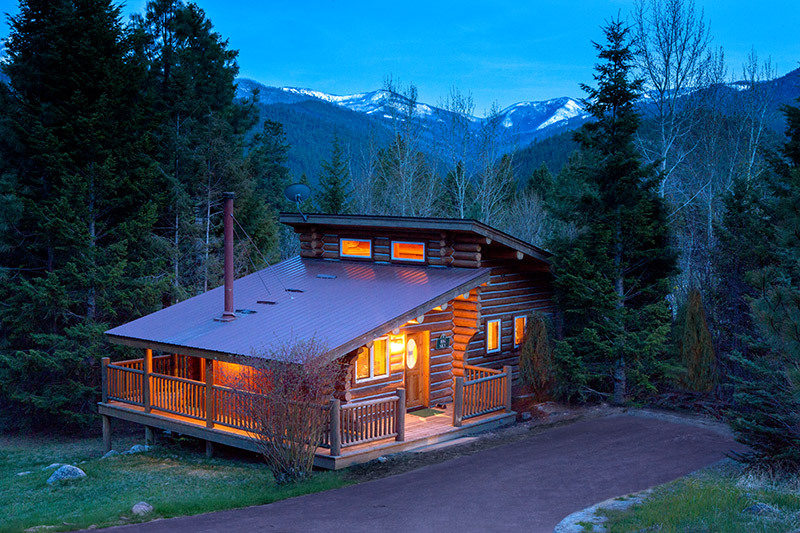 Luxury Cabins offer the most secluded locations, plus separate living rooms, spa decks and steam showers. Lenox, Massachusetts — Exquisitely restored 19th-century Italianate palazzo amid 22 acres of parkland. Among the 19 lodgings, the five Junior Suites offer baths with soaking tubs and separate showers, and balconies with views of the serene, wooded landscape. Contemporary and traditional furnishings accent the Great Hall and lounge. 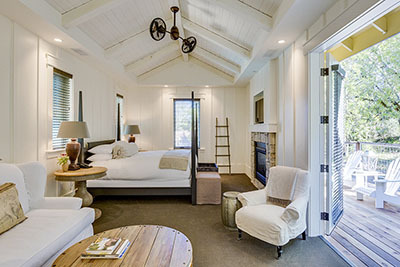 Forestville, California — Family-owned country-style Farmhouse Inn in the Russian River Valley offers 25 rooms and suites in an 1873 clapboard-sided farmhouse, adjacent farmworkers’ cottages and a barn. The menu of the Michelin-starred restaurant draws on agricultural diversity of the area, with an extensive list of wines. 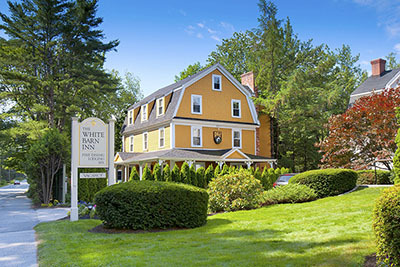 Kennebunk Beach, Maine — Sophisticated inn situated in colorful Kennebunkport, 30 minutes from Portland. The 26 stylish rooms, suites and waterfront cottages are decorated with antiques. Accommodations in the former carriage house, feature granite and marble baths and rainfall showers. The inn’s restaurant is housed in two restored 19th-century barns. 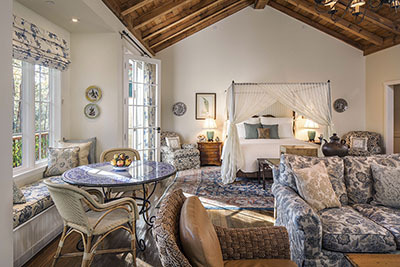 Monterey, California — Vine-smothered bed-and-breakfast in a three-story manor amid specimen shade trees and English-style flower gardens, a short drive from Monterey’s shops, restaurants and golf courses. Many of the 10 rooms feature working fireplaces, separate sitting areas, copper detailing and stained-glass windows. Saranac Lake, New York — Evocative property formerly owned by the Rockefeller family, on Upper Saranac Lake, 45 minutes from Lake Placid. 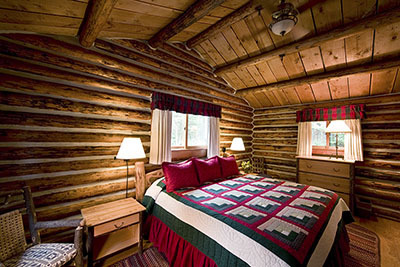 Eleven distinctive accommodations are housed within an imposing log structure and three annexes. Most feature stone fireplaces, custom furnishings and luxurious baths.